We had friends at home for diner the other night, and I over spec the diner portions, so, rare enough, I had enough left overs for a second diner. But because I don't like eating twice the same thing I arrange it in completely different maner. 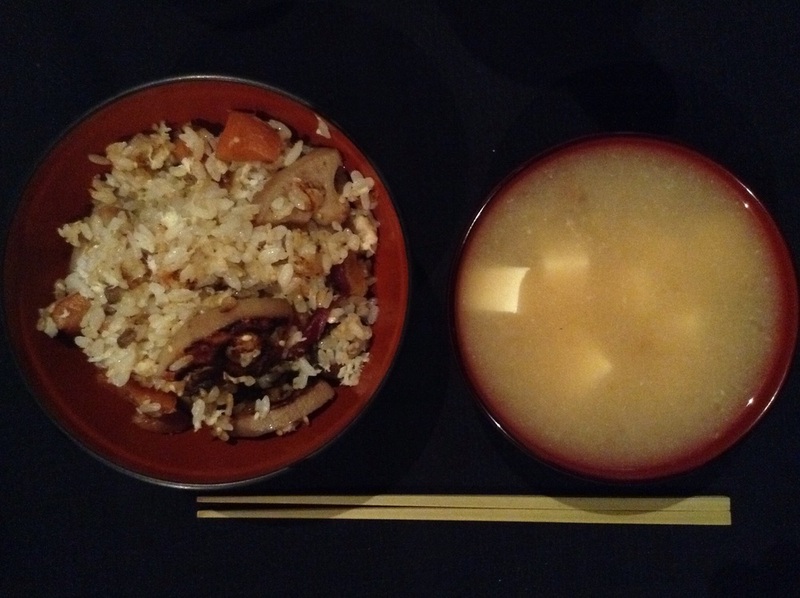 The original dinner consisted in plain white rice, Japanese autumn veggies (sweet potatoes, litus roots, carrots, eringi mushrooms, turnips...) in dashi and sake, salt-grilled sawara, and a mushrooms and tofu miso soup. The new version was a cha-an (sauteed rice) with sawara and sauteed veggies, with sesame. For that I fried the rice in a bit of oil, added a table spoon if sesame seeds, added the veggies, and stirred often. I removed the skin and bones of the fish and crumbled it in the rice, stirred again and served. A super delicious diner, ready in 5 min, just perfect after a long day at work!